In the first of three blog posts, we explore the real world applications for graph visualization, starting with law enforcement and fraud management. “Data is the new oil”– it may be a cliche, but it’s true. Like oil, data in its raw, unrefined form is pretty worthless. To unlock its value, data needs to be refined, analyzed and understood. You can say the same about graphs. More and more organizations are seeing potential in their data connections. The question is, how do you get non-experts to analyze graphs at scale and understand potentially complex insight? Most of the time, the answer is through interactive graph visualization. It’s intuitive – presenting a graph as a node-link structure instantly makes sense, even to people who’ve never worked with graphs before. It’s fast – our brains are great at spotting patterns, but only when data is presented in a tangible format. Armed with visualization, we can spot trends and outliers very effectively. 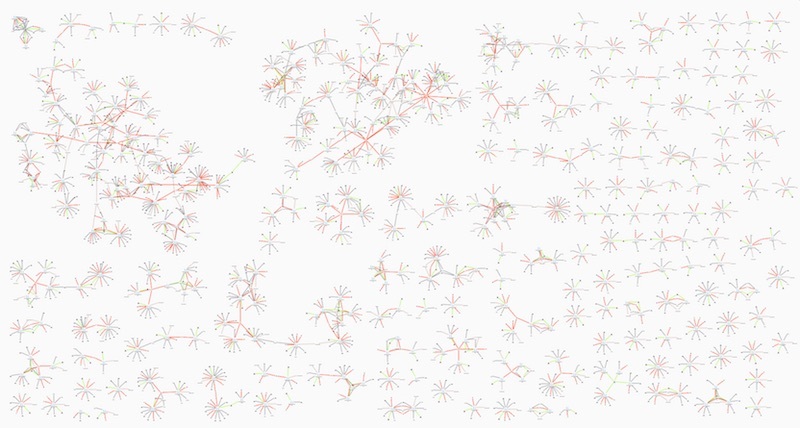 It’s flexible – the world is densely connected, so as long as there’s an interesting relationship in your data somewhere, you’ll find value in a graph visualization. It’s insightful – exploring graph data interactively allows users to gain deeper knowledge, understand context and ask more questions, compared to static visualization or just looking at raw data. In a growing number of domains, graph visualization has become a must-have data analysis tool. Let’s take a quick look at the ways graph visualization is being used in real life. Graph visualization isn’t new. The police have been using it – or link analysis as it’s commonly known – for decades to ‘join the dots’ in investigations. What has changed is the use of technology to make joining the dots a more automated and scalable process. A failure to analyze the bigger, joined-up picture was cited as a shortcoming of the intelligence services after the 9/11 terror attacks. In the years that followed, law enforcement and security agencies drove graph visualization forward. New approaches and technologies were created specifically for large-scale data analysis of communications records, open source intelligence (OSINT), and police databases. Lawful interception, the legally mandated interception of personal communications data, provided huge volumes of data on criminal and terrorist activity. Paired with social network analysis, graph visualization techniques allowed non-specialized staff to explore the data and uncover important insight. Over time, new use cases for graph visualization have emerged. We’ve worked closely with Microsoft Services to build a call-handling interface that helps UK policing teams respond to incidents more effectively. 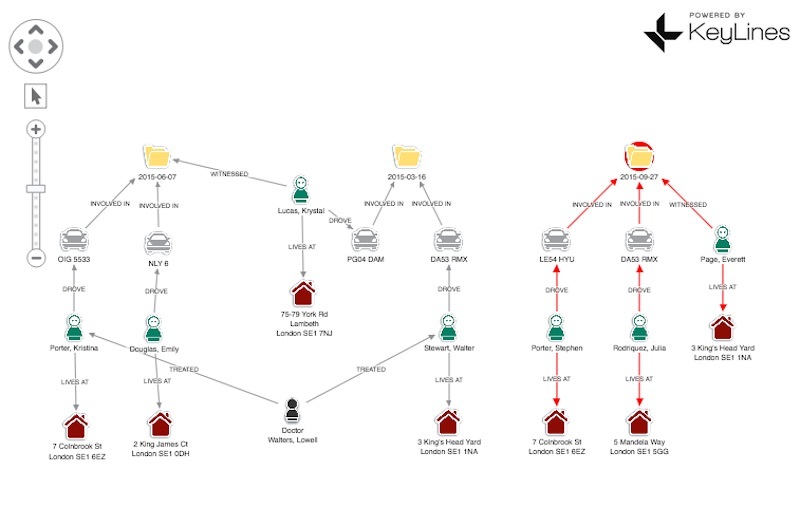 Our recent webinar with Neo4j showed how visualizing crime records data helps users to understand patterns and allocate resources better. This blog post explains two possible uses for visualization in an event and investigation-led approach. We’ve also seen how visualizing OSINT (in this case, advertising data) could help uncover human trafficking activity. 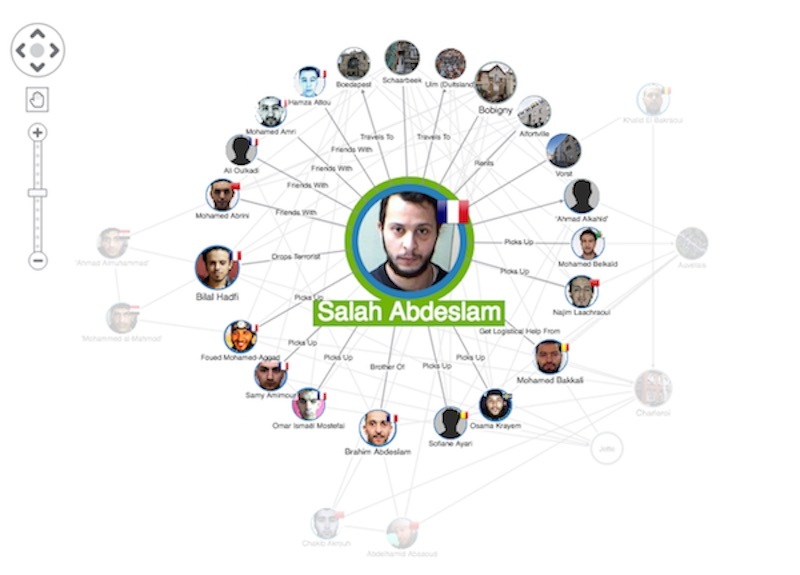 A visualization of some of the individuals involved in the 2015 Paris terrorist attacks. Read more. This kind of analysis is complex and highly specialized, so many law enforcement agencies choose to build their own visualization solutions instead of relying on off-the-shelf products. The scale of the data being analyzed has also transformed the nature of the visualization: it’s now essential to have effective layouts, filtering and grouping, as well as more powerful rendering. Another early adopter of graph visualization techniques was the financial services industry. Fraud detection is about finding unusual connections – between accounts, transactions, insurance policies, devices, etc. There’s great value in visualizing that data as a graph. As we discussed in this blog post, the nature of the visualization will depend on whether you’re looking for known or unknown fraud. Known fraud detection is largely automated with rule scoring and pattern matching. Visualization lets you review edge-cases and outliers more quickly. Speed is important, because sometimes analysts only have seconds to approve or deny a transaction. In those cases, visualizations are simple, small and with limited interaction. To get a clear overview fast, analysts need effective layouts. Other functionality, like expand and filtering helps fraud analysts to see context on demand. Three insurance policies and their connections, visualized as a graph. Read more. Unknown fraud requires a different process. Here we take a ‘global’ approach – loading a large volume of data and seeking out anomalies. This requires more specialized domain expertise, and a wider range of visual analysis functionality – like grouping, social network analysis and temporal analysis. Finding anomalous transactions that could indicate fraud. Read more. These two techniques are widely used in the banking and insurance industries to uncover incidences of fraud. Over time, we’ve seen these approaches used to combat other kinds of fraud, including healthcare fraud, gambling fraud, review fraud and even fake news. What do these use cases have in common? When connected data insight is critical, only interactive and robust visualization tools are up to the task. Next time, we’ll look at a use case that’s emerged more recently but is increasingly vital: cyber security. In the meantime, don’t forget to start a trial, or get in touch if you’d like to know more about KeyLines.